On the Nobel Prize front, 2009 is turning into a banner year for both nucleic acid chemistry and women scientists. As I posted earlier this week, two of the three winners of the 2009 Nobel Prize in Medicine ("for the discovery of how chromosomes are protected by telomeres and the enzyme telomerase") are women. And today it was announced that the Nobel Prize in Chemistry was awarded to Ada E. Yonath along with Venkatraman Ramakrishnan and Thomas A. Steitz "for studies of the structure and function of the ribosome." The last woman to be awarded the Nobel Prize in Chemistry was Dorothy Hodgkin, who won the prize in 1964 for her advancement of the technique of X-ray crystallography for determining the structure of biomolecules such Vitamin B-12. 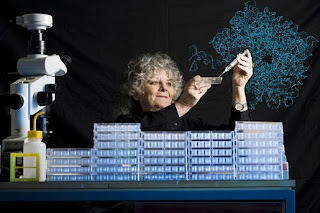 Now, 45 years later, Ada Yonath has been recognized for her work determining the structure of ribosomes, using, once again, X-ray crystallography. As most introductory biology texts diagram it, the "usual" flow of information in the cell1 goes from DNA, which is used as a template for the synthesis of messenger RNA (mRNA), which in turn is used as a template for the synthesis of proteins. Ribosomes are cellular organelles that mediate the third step, translation of the nucleic acid sequence into a the chain of amino acids that make up a protein. The ribosome, with its molecular weight of about 2.5 MDa is not only large but, unlike many virus particles, does not display symmetry properties that would facilitate crystallization and structure determination. In the years around 1980 it was therefore unclear whether crystals of the ribosome diffracting to high resolution (~3Å or less) could ever be found and, granted the existence of such crystals, whether the phase problem could be overcome and structures obtained. In this context, the report on three-dimensional crystals of the ribosomal 50S subunit from the thermophile bacterium Geobacillus (G.) stearothermophilus (previously called Bacillus stearothermophilus) in 1980 by Ada Yonath and colleagues (Yonath et al., 1980) was therefore a significant step forward. This knowledge can be put to a practical and immediate use; many of today's antibiotics cure various diseases by blocking the function of bacterial ribosomes. Without functional ribosomes, bacteria cannot survive. This is why ribosomes are such an important target for new antibiotics. This year's three Laureates have all generated 3D models that show how different antibiotics bind to the ribosome. These models are now used by scientists in order to develop new antibiotics, directly assisting the saving of lives and decreasing humanity's suffering. My father died when I was 11 years old and left my mother with me and my sister but no income, so I was needed at home. Nevertheless, my mother realized my lust for science and provided me with massive emotional support. She did not object to my academic studies, although at the time this was not so common for females. When I became a scientist, my mother, sister, and later on my daughter and granddaughter always supported my scientific activities, in my presence as well as in my frequent absences. Her elementary school math teacher Zvi Vinitzky introduced her to the principal of the elite Tel Aviv high school, Tichon Hahadash, Tony Halle. Impressed by the young girl's abilities, Halle admitted her to the school although she was not able to pay for the tuition. In repayment, Yonath tutored young Bulgarian immigrants in math. After receiving her bachelor's degree in chemistry and master's degree in biochemistry from the Hebrew University of Jerusalem, she entered the laboratory of Wolfie Traub at the Weizmann Institute of Science in Rehovot, Israel. She earned her Ph.D. for X-ray crystallographic studies of collagen in 1968. After brief postdocs at Carnegie Mellon and MIT, she returned to the Weizmann Institute to establish the country's first protein crystallography laboratory in Israel. Despite her expertise in X-ray crystallography, many scientists were skeptical that the technique could be used to determine ribosome structure, only they apparently didn't express it quite so tactfully. [...] she was able to count on the support of "a few individuals, including several distinguished scientists and my own group of young and highly motivated students. They encouraged me even when my project met with rigorous skepticism from most prominent scientists all over the world, even when I was called 'a dreamer,' 'crazy' or the 'Village Fool.'" [...] with the techniques then available, it took Yonath months of trying different solutions and crystallization procedures to get tiny crystals of the larger, or 50S, subunit of the ribosome from a Bacillus bacterium, and more than a year to get the first very fuzzy x-ray crystallographic images. But when she showed colleagues her results at an August 1980 meeting, "everyone laughed at me," Yonath recalls. She eventually figured out that she needed to cryocool - freeze - the ribosomes to stabilize the crystals long enough clear data, a technique that is still in use today. Since then Yonath has continued her research on ribosomal structure, both at the Weizmann Instute and at her parallal post as visiting professor and later the Head of a Max-Planck Research Unit in Hamburg, Germany. Her laboratory currently focuses on the interaction between ribosomes and antibiotics. "Women make up half the population," she says. "I think the population is losing half of the human brain power by not encouraging women to go into the sciences. Women can do great things if they are encouraged to do so." 1. That isn't quite accurate, because RNA can be reverse transcribed into DNA, DNA is duplicated when cells divide, and there are other ways that information flows within the cell. The key point is that the nucleic acid sequence can be converted into protein, but the sequence of amino acids in a protein can not be converted by the cell into a nucleic acid sequence. See Larry Moran's post on the Central Dogma for more. 2. It makes me a bit sad that that even needs to be said. Top Image: "Animation of the small subunit of the Thermus thermophilus ribosome. RNA shown in orange, protein in blue." Taken from PDB 1FKA and animated by David S. Goodsell. Minor edit needed in second paragraph. You say 2009 is 35 years after 1964, when it is actually 45 years. Thanks anonymous, I've fixed it. Hello,Peggy. You are the woman of the scientist. Can you say your opinion concerning a stop of a current Gulf Stream? As far as I know, there is no human way to alter or stop the Gulf Stream current, if that's what you mean. What danger does have stopping Gulf Stream for mankind?